The excitement for warmer temperatures is boiling over on my social media feeds, as I see friends talking about their first snowballs of the season, staying out in daylight past 5pm, and gearing up for French Quarter Fest and the New Orleans Jazz and Heritage Festival. Much like the other 11 months of the year here in south Louisiana, there's no shortage of fun things to do in April. While the temperatures are heating up, race distances are on their way down. There are 5K's, 10K's and 1 mile runs aplenty throughout the Crescent City during the month of April; however, for the triathletes among us, one of the most daunting races in the area takes place this month. Don't be an April Fool, and get out to one of these great events in the coming weeks! 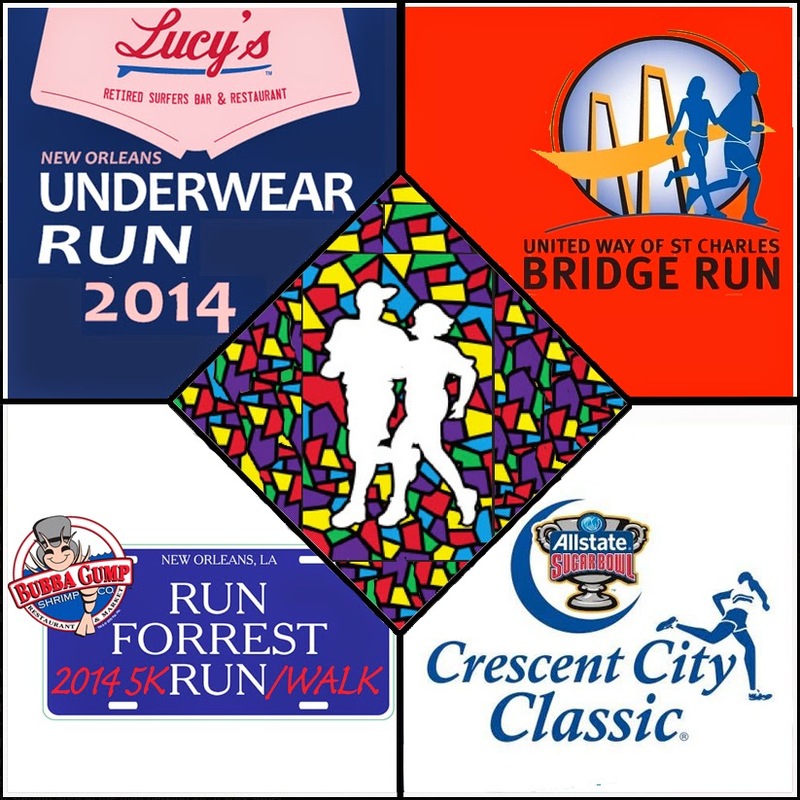 United Way of St. Charles Bridge Run 5K & 10K (Saturday, April 5th @ 8am) - The first event in the Louisiana Bridge Run Series takes place this Saturday, with finishers receiving medallions before enjoying a post-race party under the Luling Bridge. Checking this race off the list keeps participants in the running for the Bridge Run Series that takes place throughout April, May and June. Superhero Race 5K & 1K (Sunday, April 6th @ 8:30am) - Dress as your favorite super hero and take part in this event benefitting CASA New Orleans. Read more about the event HERE from Gambit Weekly. The Underwear Run 1.2 Miles (Thursday, April 10th @ 6pm) - Rescheduled because of brisk weather, this fun race will give unaware Warehouse District residents an eyeful. Ochsner Ironman 70.3 (Sunday, April 13th @ 7am) - If you haven't been training for this swim, bike and run, now's not the time to start. Read HERE about my experience spectating the 2013 event, and make sure to take note of the new run course for this year. Get out to support those dedicated and inspiring Ironman participants! A Run Through History 5K & 1 Mile (Sunday, April 13th @ 8:30am) - This is a scenic and peaceful run through one of the most beautiful cemeteries in the country. Proceeds benefit Save Our Cemeteries and the history preserved within them. Crescent City Classic 10K (Saturday, April 19th @ 8am) - A New Orleans tradition on the Saturday before Easter brings tens of thousands of runners to the point to point course that starts at the Mercedes-Benz Superdome and ends in City Park. Stay tuned for more info on the race coming soon! Run Forrest, Run 5K (Sunday, April 27th @ 8:30am) - This spring race through the French Quarter benefits Children's Hospital and features an appearance by none other than Forrest himself. The post race party includes food from the event's host, Bubba Gump Shrimp Company. Excellent round up Fred! I totally forgot Run Through History was coming up! Thanks! Happy to help out, Jen! This list only scratches the surface of the races in the area over the next month, but it's the big ones that I could find webpages and info on.